A quick search on the Internet about offbeat places and less trodden paths will lead you to hundreds and thousands of results on this unknown gem of the Himalayas or that secret beach down south. But have you ever wondered what’s in the between these Himalayas and these beaches? A country as big and as culturally diverse as India, is sure to have a number of worthwhile offerings. All we really have to do is look! And so when I got the opportunity of visiting Chanderi, a small obscure town in the Ashoknagar district, to learn about the rich heritage, and the Madhya Pradesh art and culture, I (virtually) jumped to grab it! 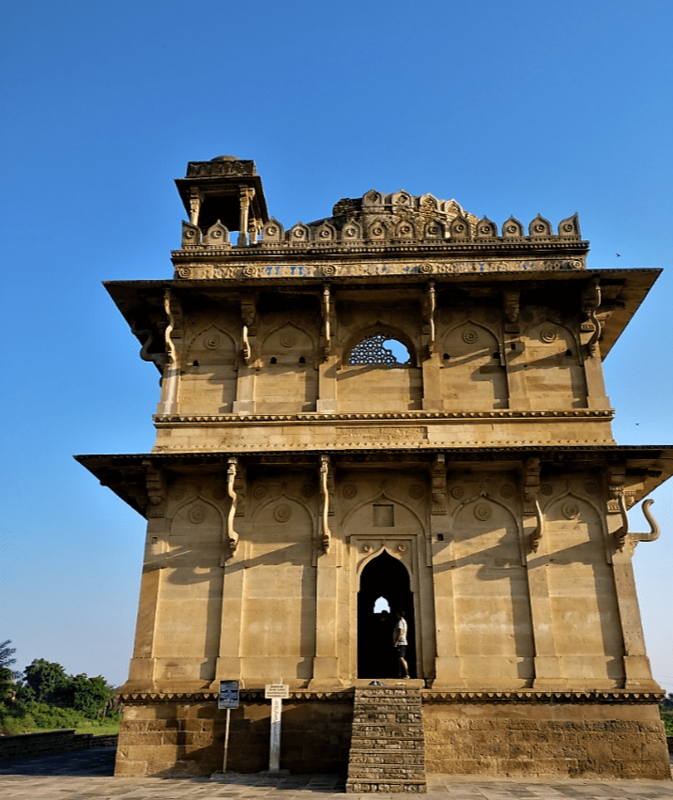 To give you an estimate of Chanderi’s richness and poignancy, for 3 days the kind people of Madhya Pradesh Tourism Department took us in and around this historically significant town, and yet we were just able to cover about half of it! Grabbed your attention yet? Let me now jump into the know hows of things and try to give you a comprehensive guide of things to do in Chanderi. The god-sent gift that the Indian Railways are, there is an eight hour long Shatabdi running from Delhi to Bhopal on a daily basis. Bhopal is the nearest Madhya Pradesh town to Chanderi. However, you can also get off at Lalitpur or Jhansi in Uttar Pradesh which are just 40 kilometers and 107 kilometers from Chanderi, respectively. Madhya Pradesh public transportation to reach Chanderi is still a bit shoddy considering the fact that it is still a very small town with almost no tourist inflow. So you can take either a private cab, or hire a tempo traveller if you’re travelling in a large group, to reach this (majestic) small town. The nearest airports are, of course, Bhopal (214 kilometers) and Indore (409 kilometers). There are one or two hotels in Chanderi which offer a decent-ish lodging at reasonable prices, but if you have a few bucks to spare on you, I recommend making your way to Kila Kothi, the beautiful luxury hotel situated on a hillock overlooking the entire town! 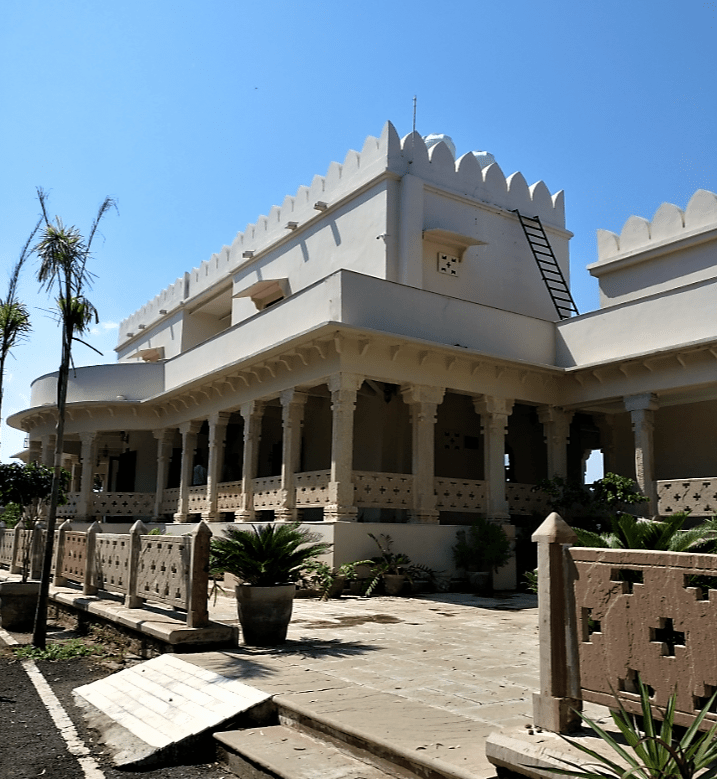 This hotel is an annex to the magnificent Chanderi Fort which is hardly a minute’s walk away from the hotel. The hotel is basically made out of a part of the part and they have kept intact most of it, giving it a very authentic royal touch. Even the interiors of every single room is to die for- so minimalist, yet aesthetically pleasing! 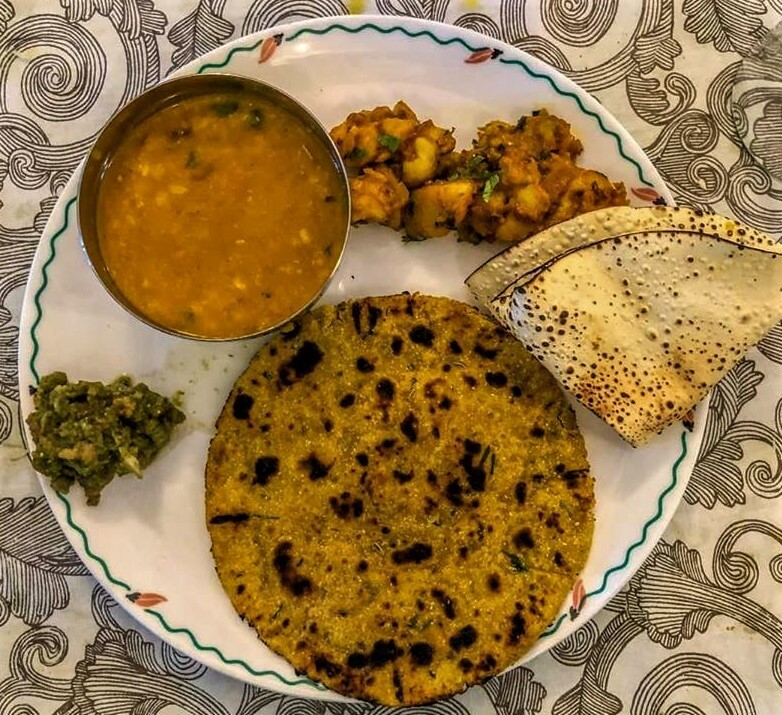 One of the most famous meals of Madhya Pradesh are Dal Tikkad and Aaloo Pyaaz sabzi. Dal Tikkad is yellow lentils served with a thick chapati made of gram flour, turmeric, ghee and some other magical ingredients. With this you get a mix vegetable dish of onions, potatoes and tomatoes. This meal is incomplete without their signature green chutney made of green chillies and tomatoes, and some churma laddoos for dessert! You can get this meal at any local dhaba or restaurant in Chanderi, or ask the kind souls at Kila Kothi to prepare it for you. And boy, will they prepare it with all the love they have! Now, brace yourself because this is going to be a long, long list that probably only covers a little over half of what Chanderi tourist places have to offer. Our amazing guide, Mr. Muzaffar Ahmed Ansari, fondly known as “Kalley Bhai” is a MP Tourism approved guide and was a walking library on all things Madhya Pradesh. 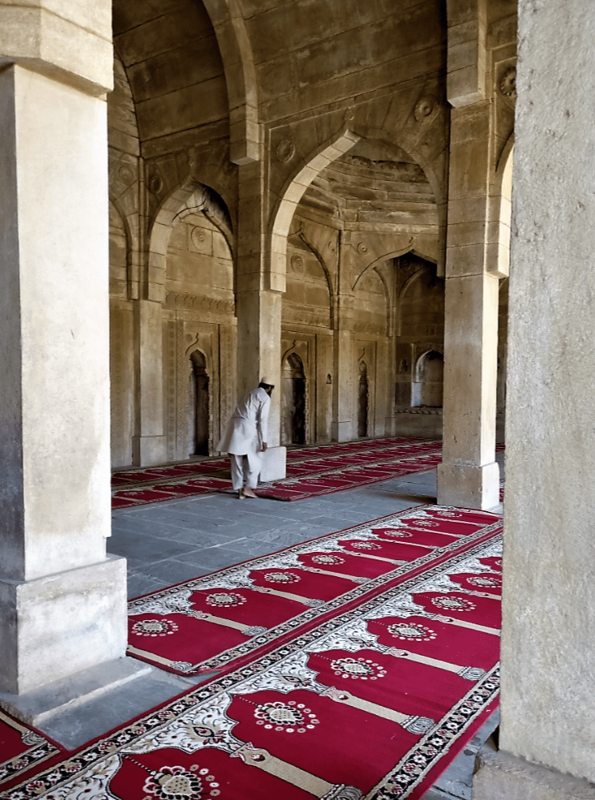 He has even made important contributions, including the manuscript of the Holy Quran, and some ages old copper and silver coins, to the Chanderi museum. This is a big fort located on the hillock overlooking the entire town, situated 71 meters above the rest of the town. The entrance to this fort is known as khooni darwaza or ‘bloody gateway’ owing to the large number of capital punishments that took place here, during the reign of the Mughals. 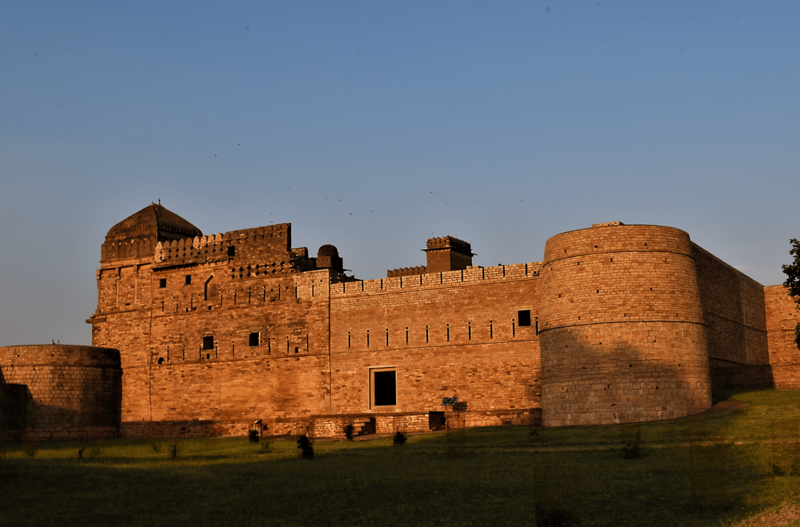 The fort is adorned with spectacular lattice work and makes for a great place to enjoy a beautiful sunset. Another place of historical importance within the fort is the Jauhar Monument. A macabre Rajput tradition made famous by the (in)famous movie Padmavat, Jauhar was an age old ritual of mass suicide wherein women in large numbers would collectively walk into massive fire pits with their children in their arms. When the Mughal rulers had taken over Chanderi from its previous Rajput rulers, the women committed this act of defeat, choosing to kill themselves than to face dishonor in the hands of the enemy. 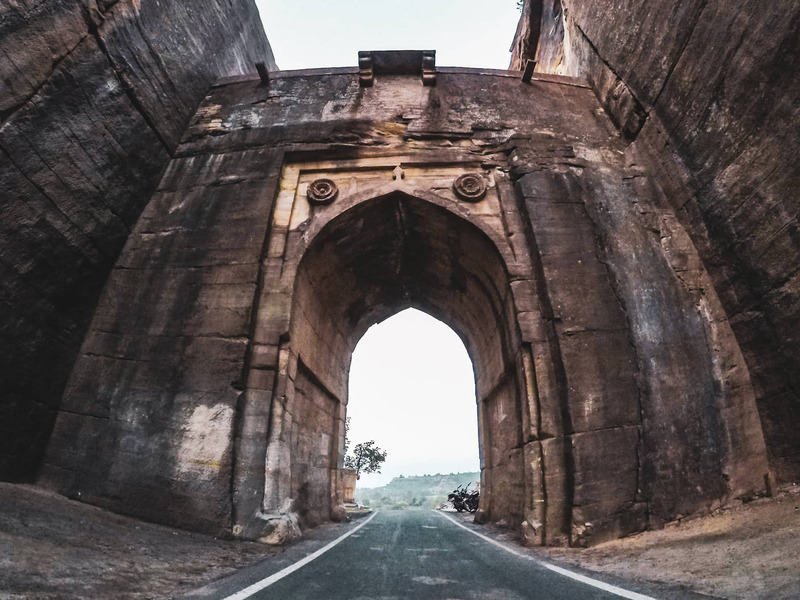 This is a gateway made by the Mughal empire cutting entirely through a living rock, separating the Bundelkhand and the Malwa regions. 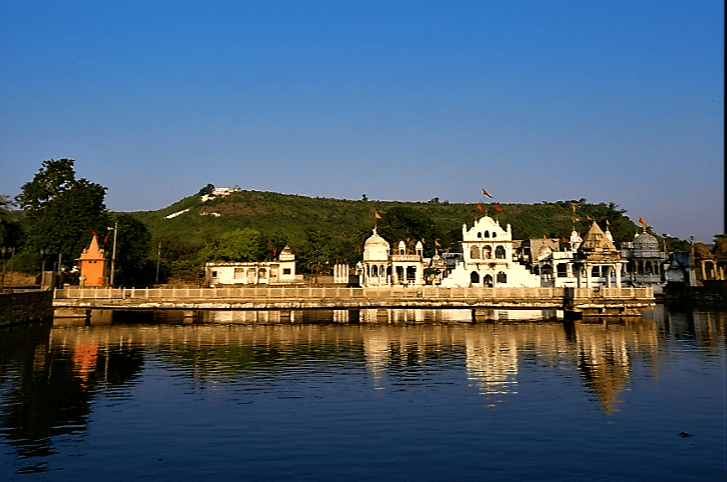 Situated by the Parmeshwar Tal, this temple in Chanderi is one of the very few in the country dedicated solely to Lord Lakshmana. The Sheshanag is the main idol of this temple. An early morning walk would prove fruitful as one can have an insight into the early morning rituals of women feeding fish, and of men taking a dip in the holy lake. This monument is a heartbreaking testimony of true love. When an unknown princess fell in love the chief of her father’s army, an alliance which was frowned upon by the King. To put this relationship to an end, the king instructed two of the chief’s soldiers to kill him after the battle they were to fight soon. When the chief returned bloody and wounded, he died in the arms of the princess. Unable to bear this sorrow, she ended her life as well. This moved the King deeply and he decided to build a mausoleum in honour of their love. Quite a story, innit?! 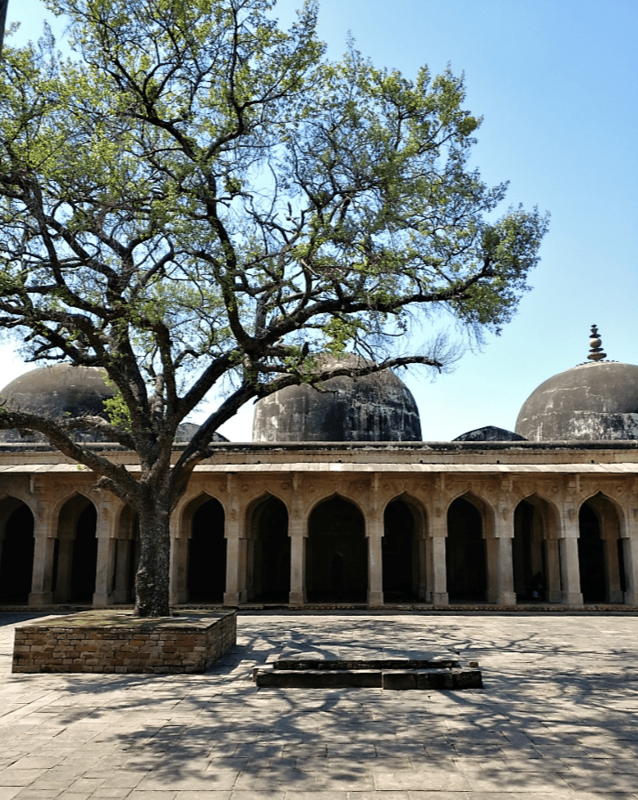 The oldest and largest mosque of Chanderi, and possibly all of Bundelkhand, the Jama Masjid was built when Chanderi came under the control of the Delhi Sultanate. A quaint and quiet open space, this cool courtyard was like a breath of fresh relief in the scorching heat. Pro Tip: If you would want to witness the big weekly Jummah prayer, reach the Jama Masjid on a Friday at 1pm to be a part of the spectacle. This palace was probably my favourite of all the historical monuments we visited during our short trip, what once used to be a mighty seven storey tall structure, is now just a a simple yet imposing building. Two of these seven storeys still remain. 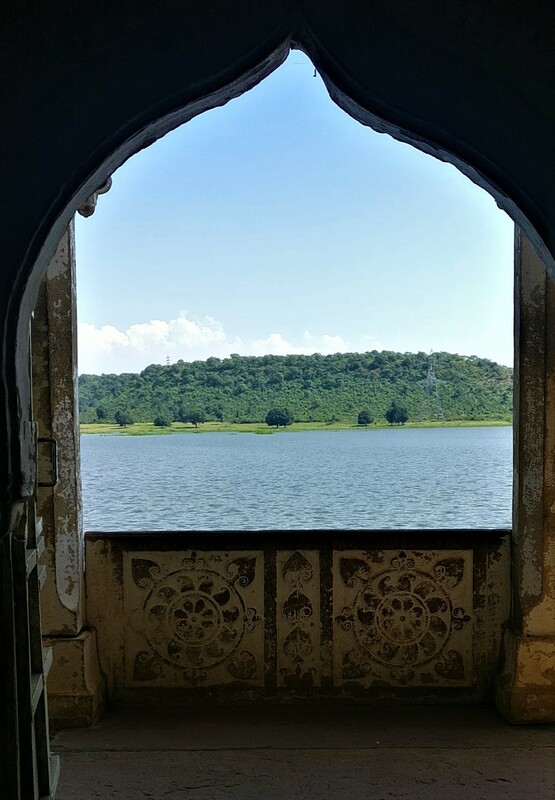 Since this is part of Chanderi is relatively cut off from the main town, it was a quiet place with nobody here except for us, and I was able to enjoy a few moments of peace, immersing in this culturally rich fairyland that I had found myself in. The road through Kati Ghati leads to this palace, which is actually not a a palace but was once a hunting lodge built by the then Maharaja. There is also an open museum here housing some Hindu idols and deities. What makes this place special is that it is located right beside an artificial lake called Mehjatiya Pool. This is also the very lake where Babur camped for a night before heading on to attack the Chanderi Fort. The cultural and religious diversity of this small town is really something to talk about. Not only are there Hindu temples and mosques here, but this is also a very important place for the history of Jainism. 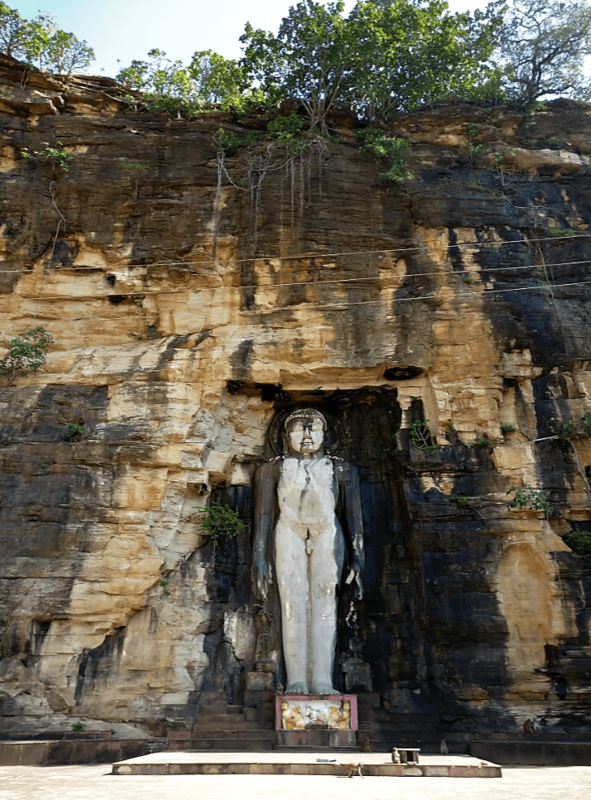 A pilgrimage site for Jains, the most striking feature of this temple is the 45 feet tall statue of the first Jain Tirthankara Rishabhnath, also known as Adinath, carved onto the surface of the hillock. 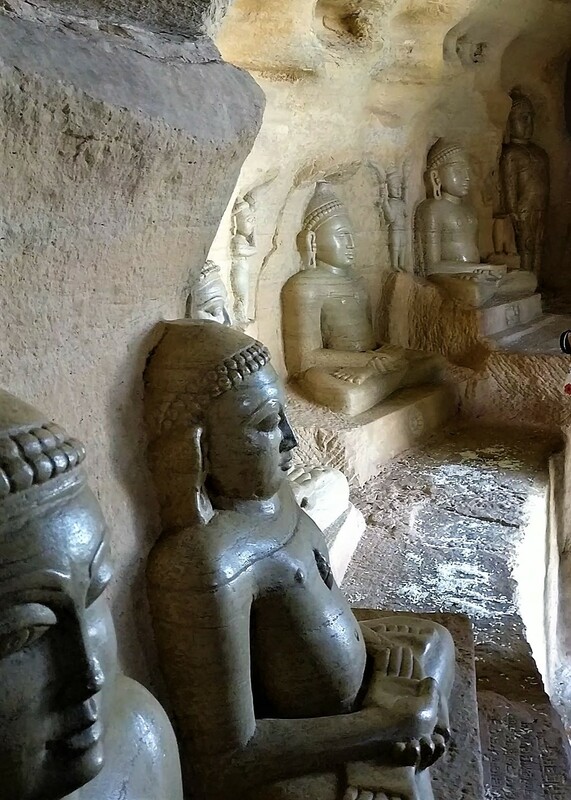 This temple is also home to two caves, both carved onto the hillock, which house significant inscribed statues of the Tirthankaras. According to these inscriptions, the oldest of these statues is over 700 years old. If there’s anything that people know about Chanderi, it is its cotton and silk woven sarees famous all across the country. These sarees are woven in the homes of the weavers of Chanderi, who live collectively in the “bunkar” (weaver) colony. Generations after generations are involved in this intricate art and craft of Madhya Pradesh. Even young children, help out their parents with the weaving work, after returning from school. The Rai Dance is a folk dance of Madhya Pradesh from the Baghelkhand region, performed during special occasions like a wedding or the birth of a child in the Vaishya community. Typically performed by women of the Ahir community, or by a man dressed as a woman in the traditional attire and ornaments, this dance is done with the accompaniment of the musical instruments dholak and nagara. This museum is the perfect show of Chanderi’s true spirit, under one roof. From archifacts like the manuscript of the Holy Quran, to Jain idols, and to Hindu Shaivya and Vishnu idols, this museum is home to all. We love transparency! This post is sponsored by Madhya Pradesh Tourism, but the views expressed are truly my own. Next Post From Dharamshala to Kareri Lake, and Everything in Between! Very vivid description of a small town which lies far away from the maddening crowd. The article urges the reader in me to take a journey to similar historical but not so traveller popular places & to reap rich benefits that our small scale industries have to offer. Beautifully written. Love the introduction of the post.